Danielle and Brian’s day was too good! There were so many happy tears, and in my (sappy) opinion, those make the best wedding days! Danielle and Brian got married at Trinity Lutheran Church in downtown St. Pete and had a MFA St. Pete wedding reception. The whole day we were surrounded by friends, family, and beautiful weather! Danielle got ready in her childhood home the morning of her wedding. Having her makeup done in her own bedroom was so touching. Three of her closest friends spent the morning with Danielle. From the second story, her veil hung into the family room. Danielle made her own veil – and hand-stitched the lace to the edges! How is that possible? She also sewed the bridesmaids getting ready robes, made the wedding invitations, and baked the reception cake! Talk about a bride with many talents! Danielle and Brian met at the Museum of Fine Arts for their first look. I put Brian in place, and when I went to find Danielle, tears slowly trickled down her cheeks. The portrait I took of Danielle before their first look was one of my favorites from the day – so much emotion! The joy that these two shared during their first look made me wipe tears off of my own face… they couldn’t stop smiling! They were radiant! This was their wedding day! After taking portraits, we all made our way to Trinity Lutheran in St. Pete. There, Danielle’s grandmother put on one of her own bracelets that her husband had given her, many years ago. We all know that he was there at the wedding as well looking down over Danielle and Brian. The ceremony was a celebration of Danielle and Brian coming together as one. Excerpts were read in English and German. Brian and Danielle exchanged vows that they wrote themselves. They also performed a foot-washing ceremony, demonstrating their humble devotion to each other. After they were proclaimed husband and wife, Danielle’s family got up and sang in German – which was a total surprise to the guests, and brought another round of tears into everyone’s eyes. The reception at the Museum of Fine Arts St. Pete was held in the Marley Room. 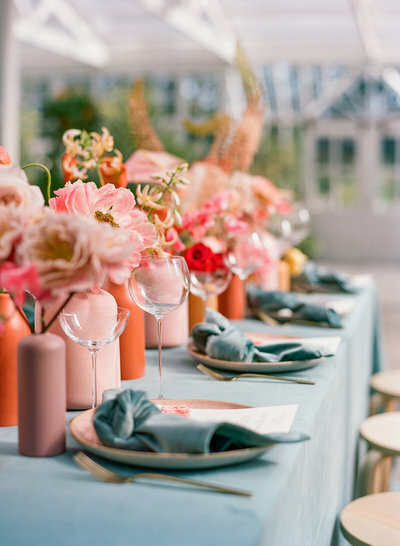 Each table was set with a springtime floral centerpiece. Danielle and Brian’s sweetheart table sat upon the stage. In the corner sat Danielle’s three-tiered homemade wedding cake! Once the reception began, the party didn’t stop until the very end! The dance floor was packed all night long – it seemed as though the guests didn’t even want to stop for dessert! At the end of the evening, Danielle and Brian exited through a tunnel of sparklers, down the front steps of the Museum. It was a beautiful ending to a perfect wedding day! Danielle and Brian – I feel so grateful that I had the opportunity to celebrate with you on your wedding day! You two were a joy from the very beginning – and my adoration for you two only grew after your wedding day! You respect each other in an inspiring way and the joy you two share is contagious. Congratulations!